April 19, 2011 May 31, 2012 Nefer Khepri, Ph. D.
Greetings! I hope the current Mercury retrograde period has been kinder to you than it has been to me. I have not been able to access my blog for the past 2 1/2 weeks. I kept being told I had to start a new account and that I was nonexistent as a current user. Prior to that, I had been super busy with work having to make my way through a huge influx of reading orders that came in all together. Very nice for my bank account, but stressful since I’m only one person. However, I was/am VERY grateful for the work (and income) and I did manage to make my way through it all. Today’s post is a new feature I began on my Facebook business page and at my Facebook groups: Magickal Musings and Magickal Musings Tarot. 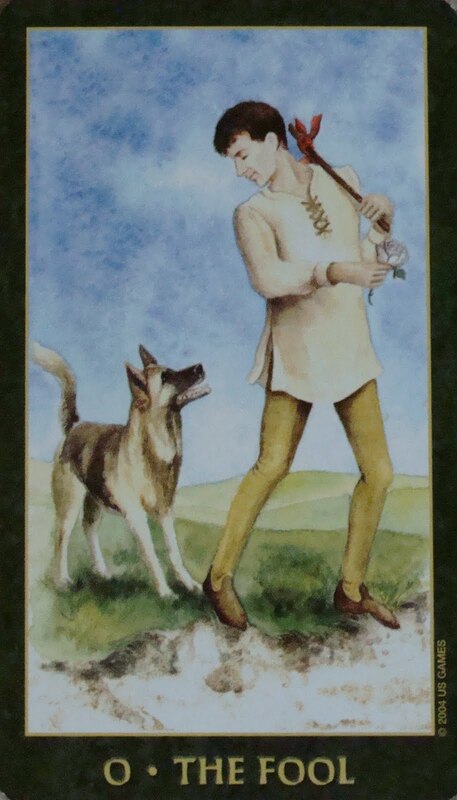 Many people post their interpretation of a single-tarot card draw and call it the Card of the Day (COTD). I’m calling my tarot card draw the Energy of the Day because for me, each tarot card has its own very unique energy signature. When you draw only one card focusing on what the day will bring the energy becomes even stronger since there are no other cards in the spread to act as an influence upon it. I will be posting my Energy of the Day posts from Facebook also on my blog for those of you who would like to check them out. They will be posted Monday – Friday. In the meantime, if you’re on Facebook, please click on the link above to “like” my business page there: Magickal-Musings.com. Once I get to 100 “likes” I will draw 1 fan at random to receive a free single votive enchantment. That’s a $45 value. From The Forest Folklore Tarot by Kessia Beverley-Smith. US Games. 2004. First Edition. Taking a risk. Having faith in a higher power. New opportunities. Innocence. Embracing what life has to offer. Starting on a new venture: project, job, possible relocation. New energy is being ushered in with the imminent close of the current Mercury retrograde period. Open yourself up to receiving the new-ness that is attempting to enter your life. Know this is for your higher good. Come April 25th (the first week day after Mercury goes direct) it will be a great time to get new projects off the ground. “A young man and his dog, both full of enthusiasm, set off on a journey. The youth is busy enjoying the world around him but does not see the imminent danger ahead. The innocent one. THIS DECK IS FOR SALE. $16, shipping in domestic US included . Add $10 for international shipping. The deck is in MINT condition. Another one that I really liked the artwork, but it never decided to like me. The LWB has highlighting in yellow pretty much throughout. Cards are typical tarot-card size. They are very laminated & won’t wear out anytime soon. Despite that, they do shuffle well. Card backs are fully reversible. Reverse meanings are included in the companion book. Please help to send this deck to a good home. PRICE: $16 in the US, $26 international.